This year, our very own Style Girlfriend Megan Collins joined me on my podcast, Ask a Clean Person, to help me kick off the bed-making festivities. Give it a listen! It was great to have her on the show for a little Inventory crossover fun. Oh right, LAMOB — you’ll be wanting to know about that. It stands for Let’s All … Make Our Beds, and it’s a truly terrible acronym that, like a middle school nickname (mine was Chovie, what was yours? ), stuck and I can’t abandon it now. Hey, umm, how often am I supposed to be washing my sheets? Once a Month: That’s Fine. Not Good. Just Fine. Okay but what about pillows, and comforters or duvets? Am I supposed to clean those? Yup, but you don’t need to do so nearly as often as the sheets. In fact, 1-2 times a year is enough! Maybe more if you have pets or children who sleep in, on or around your bed because they produce more messes (pee, you guys, I’m mostly talking about pee) and also contribute to that sort of stale body smell that will take root in your pillows, comforters, duvets, etc. over time. The care tag will tell you how best to clean these things when the time comes but, for the most part, those items are machine washable. If your own washer is on the small side, a trip to a laundromat, where there will be oversized washers, may be needed. Also, when it comes to drying filled items like pillows, duvets, comforters, etc. using dryer balls is smart because they will speed up drying time and help to redistribute the fluff. Jolie, I’m a grubby monster who made [X,Y,Z] mess of my bedding, can you help me? I got makeup on my sheets, help! Yup yup, you need OxiClean MaxForce Laundry Stain Remover Spray. 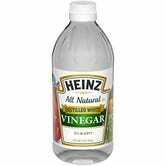 Spray it on the makeup stains, rub the fabric against itself, and the makeup should come right out. Then, launder the linens as usual. I spilled food on my sheets, help! Gotchu, boo. You need Shout Triple-Acting Stain Remover Spray. 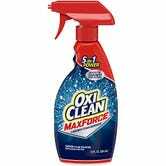 Same instructions as the Oxi — spray, frottage, launder. 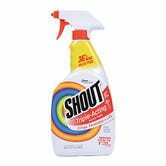 Shout is especially great on chocolate stains, which I absolutely did not learn after smearing chocolate on my white duvet cover while eating said chocolate/my feelings in bed one night. Nope! Not this grubby monster. My white/light-colored sheets are just…dingy, help! Yeah, that’ll happen alright. 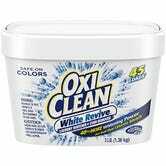 Don’t despair, just dissolve a scoop of OxiClean White Revive in enough hot water to fully submerge whatever needs to be un-dinged, and soak the soiled items for several hours prior to laundering. There’s actually a lot more to be said on this topic, but I’ll save that for a future column all its own. My white/light-colored sheets are a gross yellow-y color, help! Oh yay, you asked the best question of them all because it gives me the excuse to tell you the best best best answer! Bluing, my child. You need bluing! “What now?” BLUING! It does exactly what it sounds like it does, it turns things blue. “Jolie, WHAT now? ?” Here’s the jam: Blue and yellow fall on opposite ends of the color perception wheel, so in the case of whites that have gone yellow, adding a tinge of blue will make them appear bright white to the eye. Bluing! I dunno, everything just kind of smells bad, help? Sure thing. 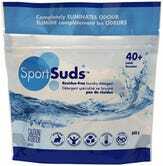 If you find that your bedding — sheets or the bigger stuff like pillows and comforters, try either laundering them using a sports detergent like Sport Suds, a known odor-blasting detergent like Dr. Bronner’s, or adding an odor-eliminating booster like Zero Odor or our old pal white vinegar to the wash.